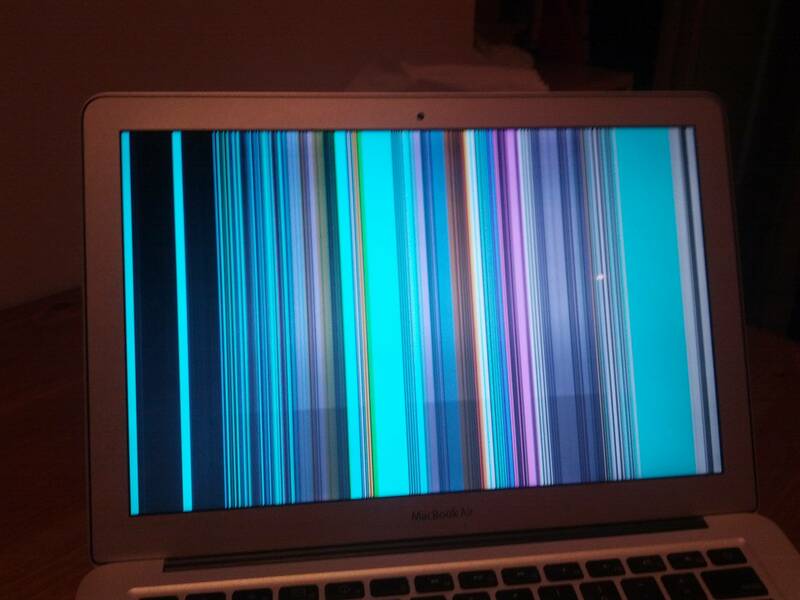 I dropped my macbook air and the screen is like this since. Does anyone know what exactly happened to it? Is it hardware or software? As stated in my comment, to diagnose if it is a software or hardware issue (most likely hardware), try connecting the Macbook to an external monitor. If the external monitor displays the screen, then your Macbook must have the problem (It's a hardware issue). If both the external monitor and the Macbook pro still won't display anything, it is a software issue. The display probably went bad. You can try pressing the screen at certain points and see if it gets restored (This won't fix anything). Press and hold the Command (⌘)-Option-P-R keys before the gray screen appears. I have the same problem. Resetting PRAM is the only way to boot and it only works on that boot. If the system is off for more than maybe 5 minutes, I'm back to the vertical colored lines. Multiple reboots in a short amount of time are ok. Does this happen for you too when you reset the PRAM? Take it to the Genius Bar at the Apple Store (hopefully you have AppleCare or under 1 year limited warranty). Disclaimer: doing any repair on your own will cancel any warranty you have with Apple. Do it only if you can't afford whatever price Apple quotes you for the repair (or any other good reason I guess). This worked on an iPad I had to fix, but did not work on a MacBook Air right now. It's "trial and error"
As explained on this thread: "Remember that the problem can be on the logic board and not the screen-- meaning you can have a logic board that works with external monitor and not the internal screen-- but to no fault of the screen. So inspect the logic board LVDS connector carefully with a loupe to see if it has any signs of visible damage like liquid shorting out or melting plastic connectors." A friend managed to rescue his MacBook Pro by spending hours cleaning the logic board. Although his problem had nothing specifically related to the display. 3. If it's not the logic board, then what is it? The display data cable is "the main communication cable between the MacBook's logic board and LCD". So... either the LCD or the display data cable has an issue. How do I know if the display or the data cable is damaged? That's the million dollar question, I did not find anything about this. Please post a comment if you do! i.e. you spilt a tiny bit of liquid on the screen & it sneaked down to the cable. i.e. you dropped the computer. If that's an option for you: go to the Apple store and get a definitive diagnosis and discuss what your options are. At least give them a phone call. If you can't go to Apple for whatever reason: getting a third party advice might be a good idea, i.e. from another repair shop. tutsplus.com: My Mac's Screen Is Broken, Now What? What is this Vertical bar of Inverted Colours on my Screen?